On the 8th Day of Christmas Cookies I remembered why I fell in love with Crackle Cookies a few years ago! It is the season for Christmas cookies and at work many friends bring in plates of cookies to share. It’s a great way to celebrate the holiday season and to try new types of cookies (and fall off the diet). I fell for this cookie at first bite! There are a ton of recipes for the popular Crackle Cookie, some use dark chocolate, some semi-sweet chocolate, and some even add nuts- hazelnuts or pecans. 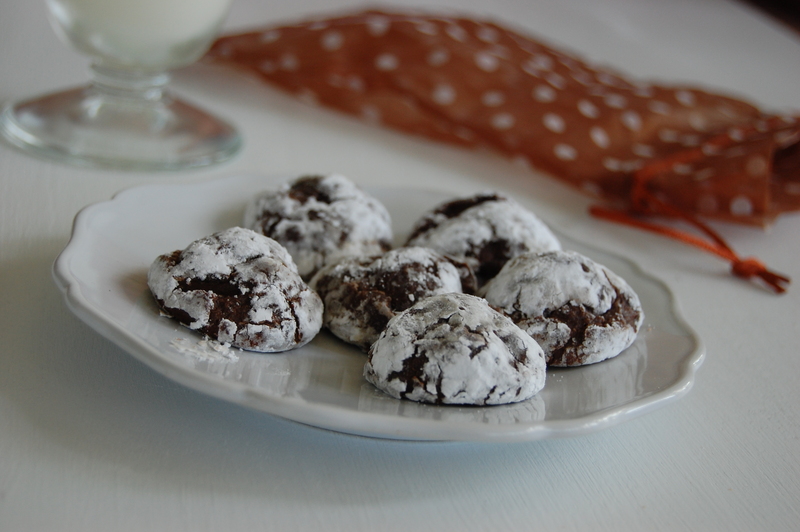 My favorite is simple with semi-sweet chocolate as these cookies are so rich. If you are a dark chocolate fan, you can just substitute bittersweet chips in place of the semi-sweet chips. Of the many recipes for Crackle Cookies I have tried, the recipe below from Culinate is my favorite. Crunchy on the outside and chewy on the inside! 1. In a large saucepan, melt the chocolate and butter, stirring frequently, until evenly melted. Set aside to cool down to warm, about 10 minutes. Stir in the sugar and then, one at a time, the eggs. Stir in the vanilla extract and the espresso powder. 2. In a medium bowl, stir together the flour, cocoa powder, baking powder, and salt. Stir the dry ingredients into the wet ingredients. The batter will have the sticky consistency of brownie batter. 3. Scrape the batter onto a sheet of plastic wrap and wrap the dough into a large ball. Place in the fridge for at least two hours (up to eight hours) or in the freezer for 30 minutes, to firm up the dough. 4. When ready to bake, preheat the oven to 350 degrees. Place parchment paper or silicone baking mats on cookie sheets. 5. Put the powdered sugar into a small bowl. 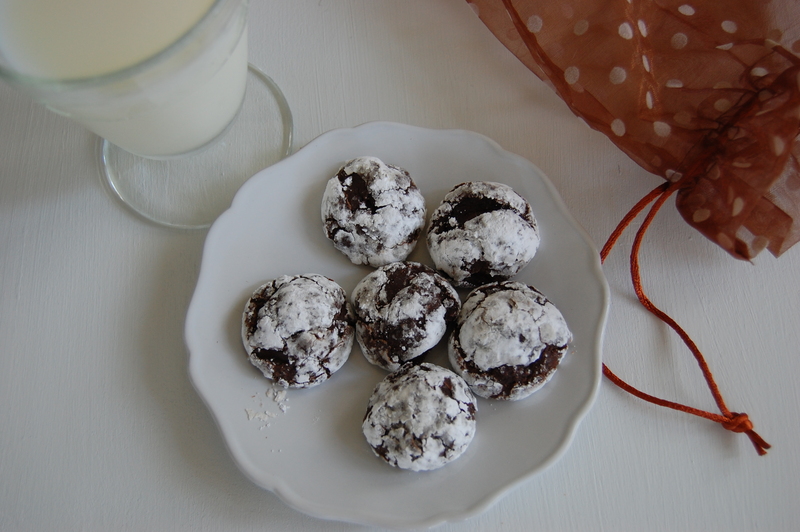 Roll chunks of the chilled cookie dough into 1-inch balls, and then roll the balls in the powdered sugar until evenly coated. Arrange the balls about 1½ inch apart on the cookie sheets. 6. Bake for 8 to 12 minutes (the baking time will vary, depending on how cold the cookie dough is), until puffed and cracked on top. Remove from the oven and let cool for a few minutes before removing the cookies with a spatula to wire racks to finish cooling. I can’t believe I went so long in life without meeting this cookie! 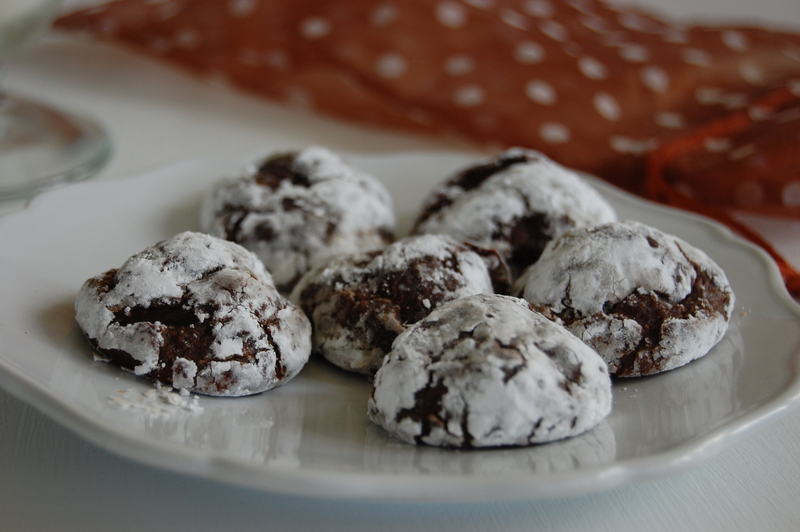 This entry was posted in Christmas, Cookies, Holidays, Recipes, Uncategorized and tagged 12 Days of Christmas Cookies, Chocolate Crackle cookies, Christmas Cookies Recipes. Bookmark the permalink. ← Benne Wafers- A Charleston Treasure! I have to say, these are simply delicious. I have a similar recipe for these that I’m making today. They are my favorite cookies. There are so many of these around at them moment and they all look very similar, they look simply amazing and clearly must be! I’ve never made crackle cookies before but they look delicious. I’ll have to try and fit this recipe in to the holiday baking. I’ve always wanted to make crackle cookies and finally did this year. Love the recipe you’ve posted. By the way – thanks for visiting my little blog project. I’ve been seeing these everywhere now, and yours look so incredibly good. Happy eating! I just discovered these this year-they are tasty-my recipe cals for giner.